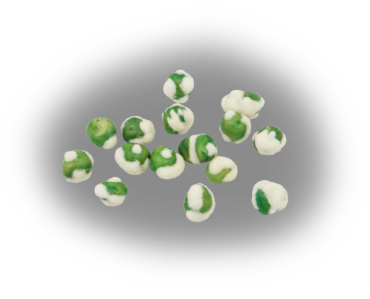 Our wasabi peas kick up the heat on our peas with a crunchy coating of tangy wasabi. Wasabi is a plant grown principally in Japan, China, and Taiwan, and is commonly referred to as Japanese horseradish. The root of the wasabi plant is grated into a paste that is then used to coat the vacuum-fried green peas. To pack a little punch, add wasabi peas to snack mixes or enjoy as a standalone snack.